is looking for hospitality superstars to join the busy team for summer. We are looking for people who have a strong passion & drive to exceed expectations. We are open 7.30am-11pm. We have casual, FT and PT positions available. Sandwich maker wanted for busy Byron cafe. Must be used to early morning starts. Be a team player. Have exceptional customer service. BUSINESS ACTIVITY: L’Ultime Patisserie has been serving Northern New South Wales the finest French cakes and pastries since 2008. Owners and operators of a multi award winning bar in Sydney are set to open a new venue in the heart of Byron Bay. Be excited – we are! Experienced Resort Housekeepers wanted. Must have experience in 4-5 star hotels. Must be a team player. Award wages paid with excellent conditions. We are a happy family of 4 looking for an experienced nanny/au pair. Our children are a funny boy of 4 and a sweet girl of 2 years old. We would like another great conscious plumber or 2nd Year apprentice to join the team ! HRH Plumbing is looking for another great team member. I am looking for a casual relief agi driver to fill for Friday 2 October and Tuesday 6 October. Build two elevated carports out of timber. Some tools supplied if necessary. Backpackers welcome. Can provide accommodation. Are you passionate about assisting ageing adults to stay in their own homes and maintain their independence? 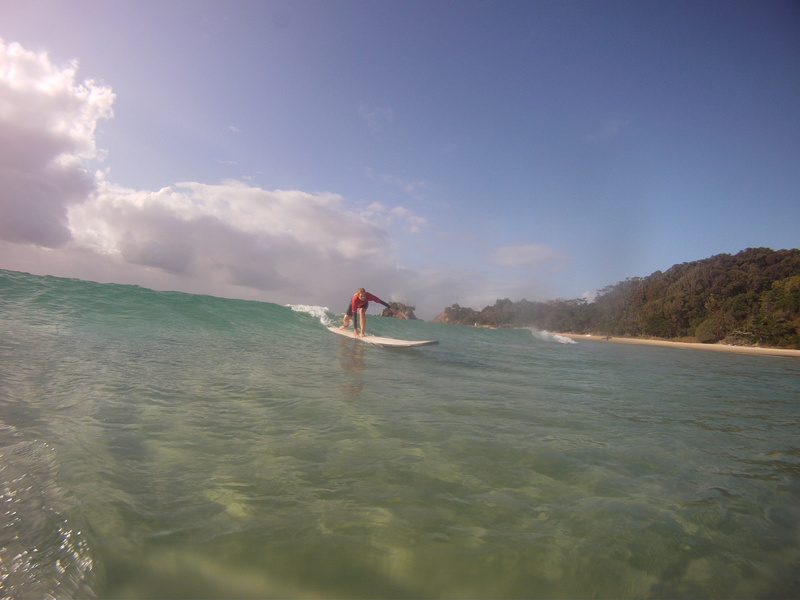 Are you in Byron bay right now ? If you can wrap some sticky tape around a couple of posters on town I’ll offer you $20. TripADeal is Australia’s fastest-growing travel company, currently seeking a full time Graphic Designer to join our dynamic team in Byron Bay. 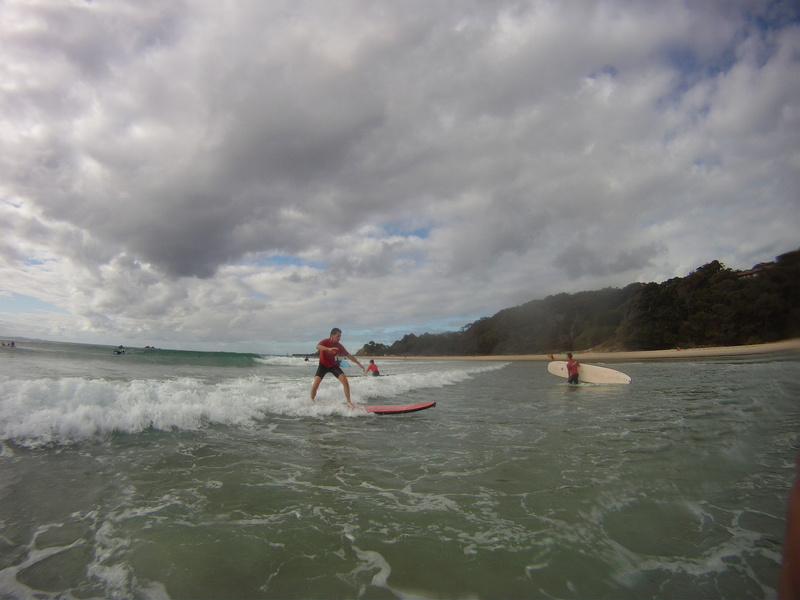 We are currently looking for a face to face fundraiser to join our growing team in the Byron Shire area. We have just released a new smartphone app (called Outbound) which is a social network for Backpackers. 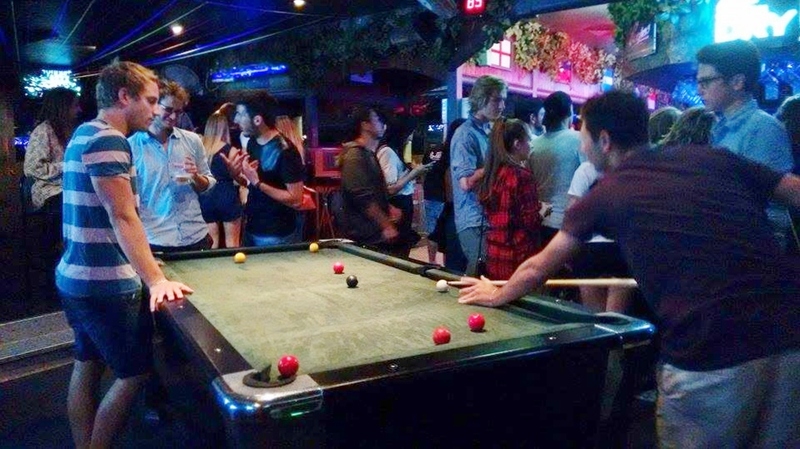 We had another fun-filled student night at Cheeky Monkey’s last night, with free food and drinks thanks to Backpacker World Travel. 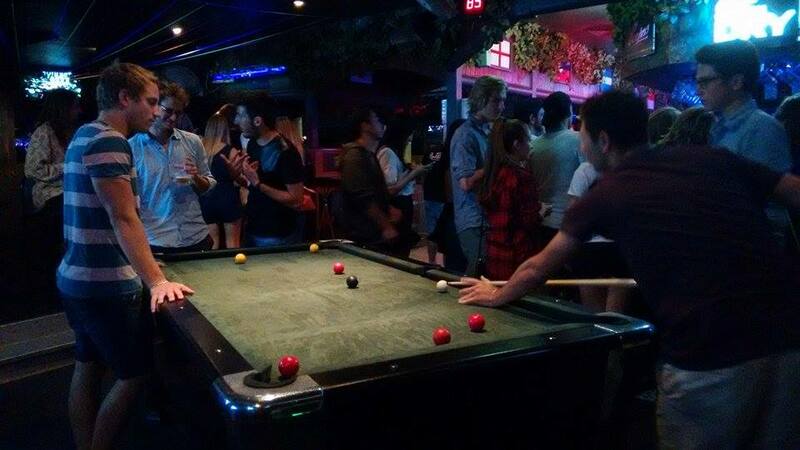 It was great to see everyone enjoying chatting, dancing, playing pool and having fun together! Today’s activity was Coffee Club! Junya, Frido, Nicole, Sofie, Ludivine, Benji, Billy, Marine and Asa joined me (Laura) in the garden for Tim Tams, coffee and conversation. Lexis is getting busier and busier at the moment, and many more new students will be joining us throughout October. 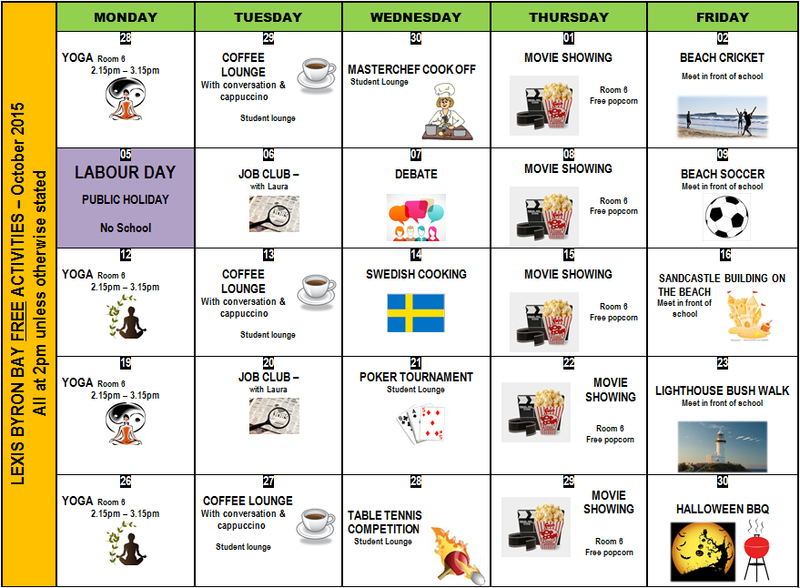 We have another busy and exciting activity calendar this month. 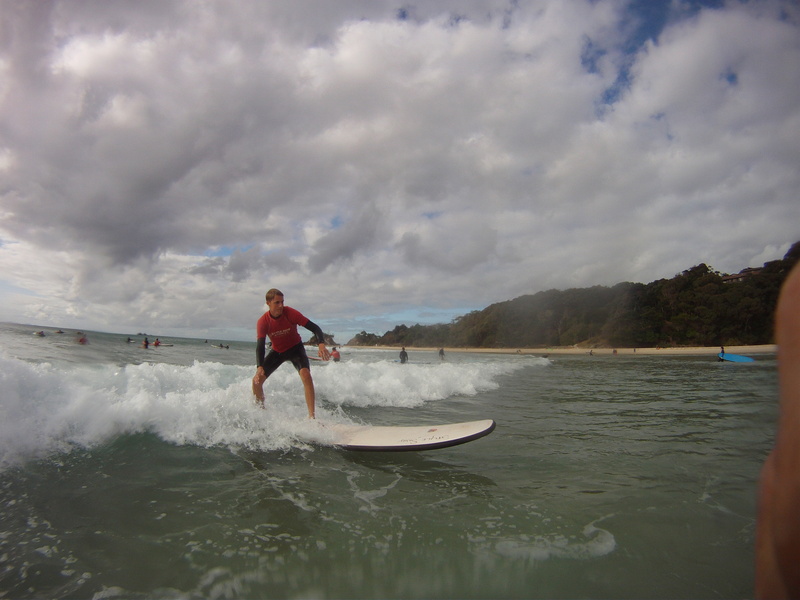 There’s a wide range each week, with creative and sports activities like Cooking, Yoga, Movies, Debating, Poker, Beach Cricket, Beach Soccer, Sandcastle Building, a Table Tennis Competition, a Lighthouse Bush Walk, and a Halloween BBQ. And, of course, we continue to run the fortnightly Coffee Lounge so you can mix with students from other classes, and the fortnightly Job Club for those who need help finding and applying for jobs. Remember, all of these activities are free, fun and a fantastic chance to learn new skills and meet other students! 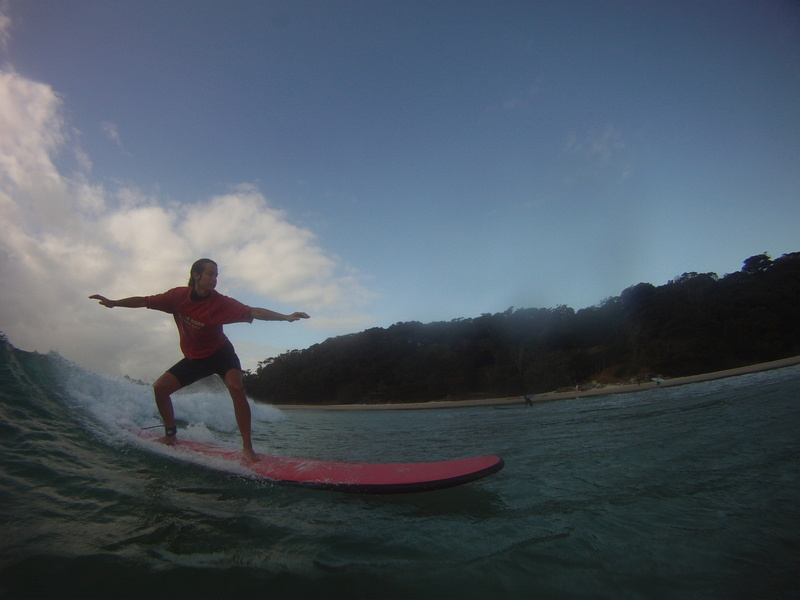 We have 7 new students starting this week at Lexis Byron Bay – Cedric, Kanta, Akira, Nicole, Billy, Benji and Marine. Kanta, Benji, Billy, Marine, Nicole, Cedric, and Akira at the back! Kanta Ohsuga is from Japan. He is a triplet! So he has 2 sisters the same age. In Japan he works as a computer programmer, so he likes PCs. 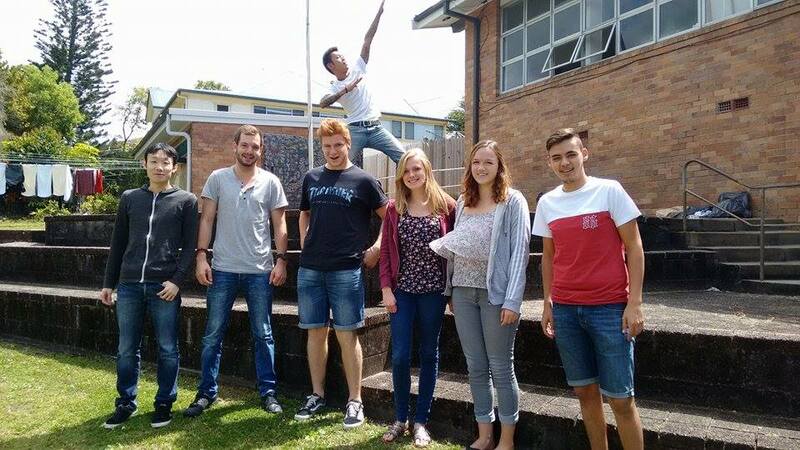 Now he is in Australia to improve his written and spoken English. Nicole Bachmann is from Switzerland and likes to go swimming or go out with friends in her free time. She also likes to read books or watch movies. She appreciates the lifestyle in Australia, and although she is here for just one month she hopes to come back in the future. Marine Dosogne is from Belgium and is a Psychology student, but now she is taking a break to improve her English, discover another country and meet people from around the world. After her time in Australia, she plans to go to Thailand. Billy Babino is from a small village in Switzerland and he enjoys skating and surfing. 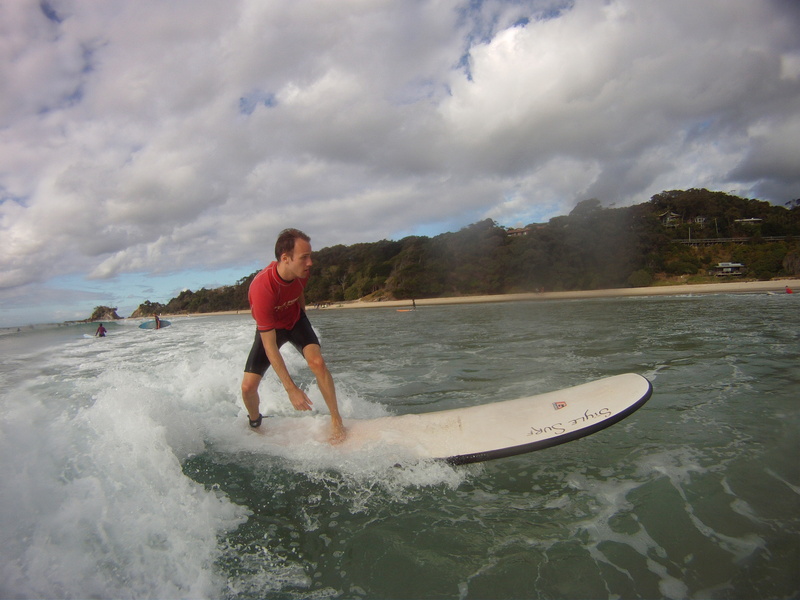 He has complated a boat building apprenticeship and chose to come to Australia because he loves surfing and the Australian lifestyle. 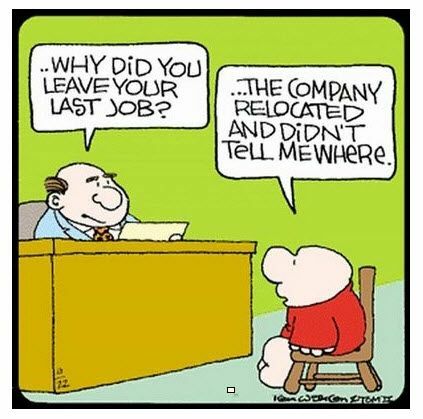 After studying at Lexis he plans to travel. Benjamin Duthaler is from Switzerland and he has worked as an electrician since finishing school. 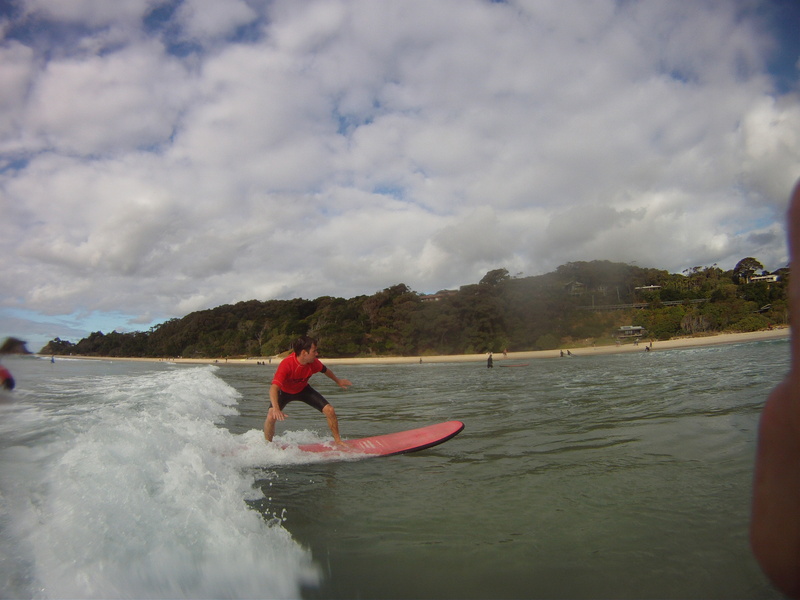 He has come to Australia to learn English and he likes Byron Bay because it is not too big, and the beach is beautiful. Cedric Esteves Fernandes is from Switzerland and he enjoys football, it is his favourite hobby. He wants to learn English so that he can travel all over the world! 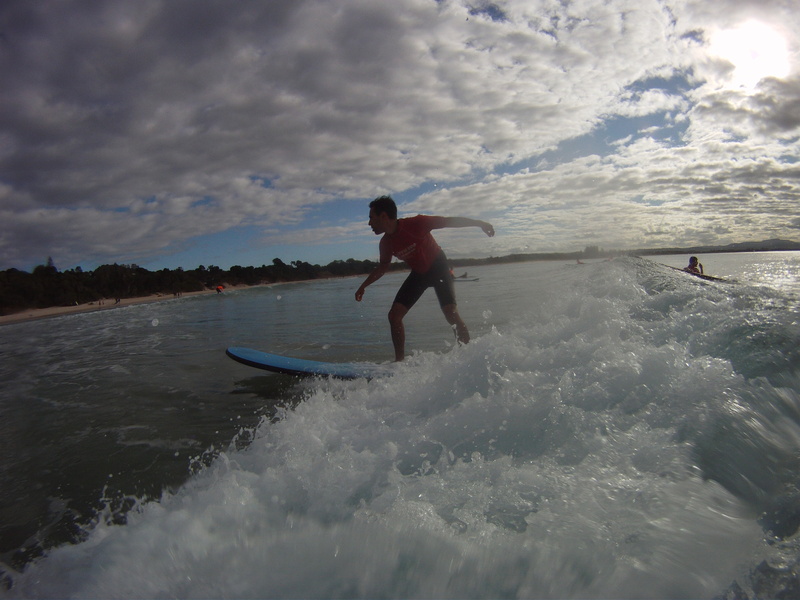 Akira Kugawa is from Japan and he loves surfing, the ocean is his life! He also loves old cars and tattoos. 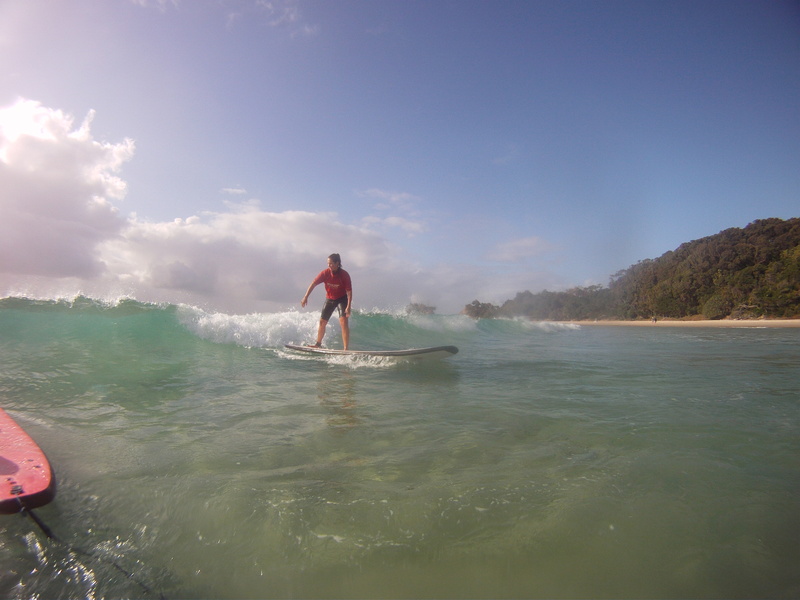 He says that Byron Bay is his paradise. 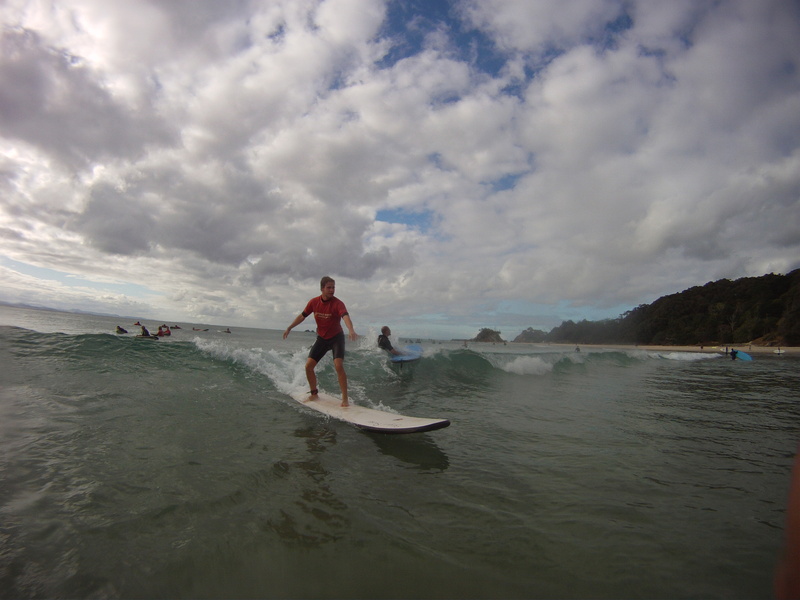 A big welcome to you all, I hope you enjoy your time here at Lexis Byron Bay. After fighting against the rain, our eyes look up to the library’s building, an appealing place, zen and spacious. Then we met the very kind librarian who showed us the different sections of the library. She explained to us how to join the library and how to use the different facilities. There’s a huge range of different books on every topic you can imagine, movies, CDs and DVDs. 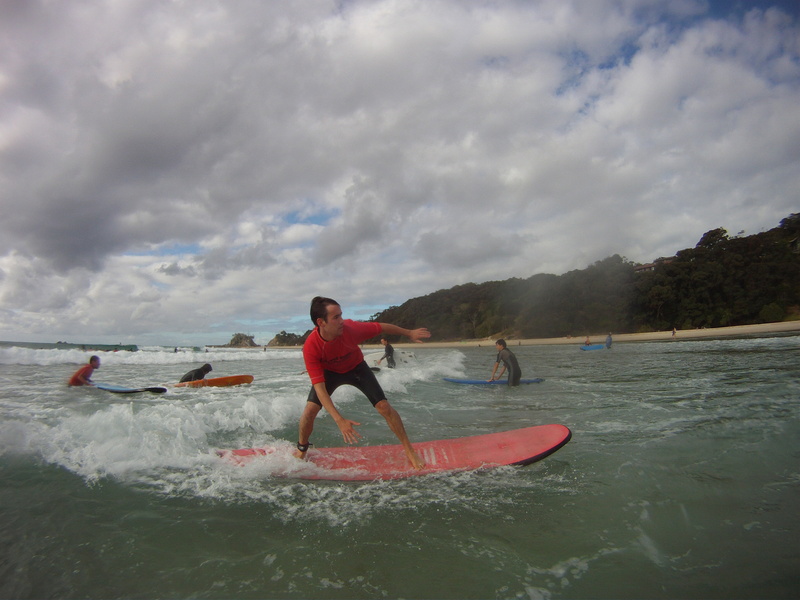 They also provide free wi-fi for everyone and a public toilet, which is quite rare in Byron Bay! I am surprised by the size of the library for such a little town. However, looking at the amount of people that are here now it could be even bigger. Sounds like a great trip! 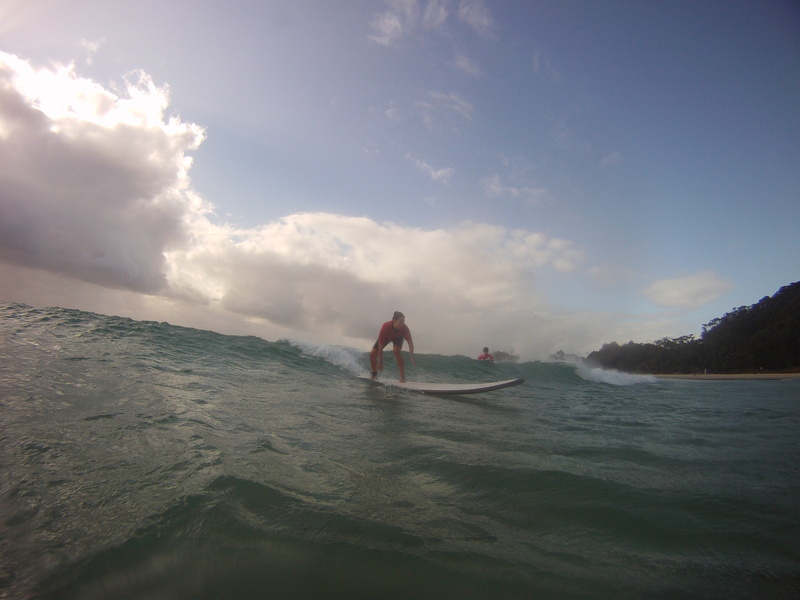 It’s always fun to explore new places in Byron Bay! 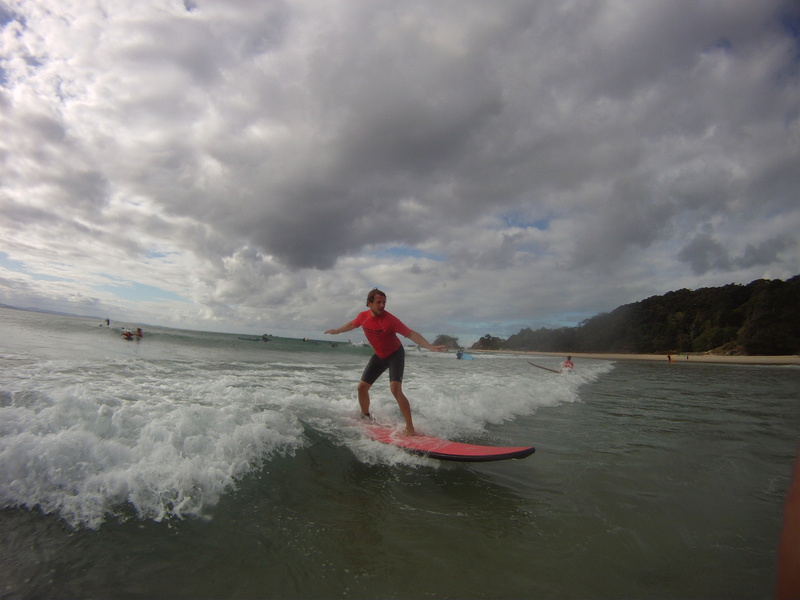 Byron Bay is a fantastic place to learn to surf, and many Lexis students have taken surf lessons with Gaz at Style Surf this month. Here are some recent photographs!